Many organizations tout a corporate ladder, positions employees can “create” for themselves and virtually unlimited opportunity within their structure. But they don’t provide a roadmap to the ladder or a path to success for team members who aren’t sure where they want to go (but know they don’t want to stay where they are forever). Not to mention, if they do have an organizational chart it just shows where everyone currently is—not where they could be and certainly not how to get there. 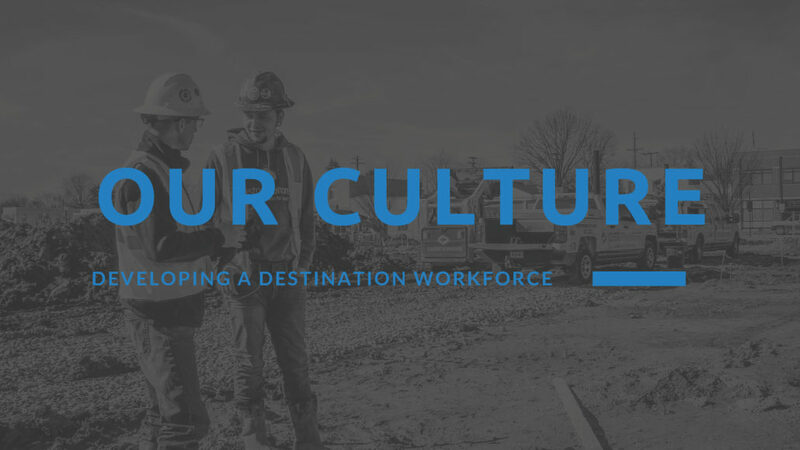 That’s why Custom Concrete made the decision to become a destination employer, a place where people would want to work because they see and hear what it’s like to be on our team and witness the potential for real professional growth. To do that, our first task was to develop a destination workforce. Our guiding focus has been (and always will be) to provide our customers with the high-quality products and services they require and deserve. To do this, we understand the importance of valuing, respecting and developing the talents of each employee while creating a team structure focused on meeting and exceeding the needs of every customer. We’re big believers in building something to the very best of our ability, whether it’s a new project our team is working on in the field or the career path for one of our valued team members. You may have read how Custom Concrete defines success or how we’re working to build a stronger community around us. But what you may not know is how we are encouraging our employees to be the best versions of themselves every day they come to work. So, we recently partnered with some folks who know more about professional development than we do to help grow our team members into the best versions of themselves. We’re excited to work with innovative groups like Indianapolis-based Lessonly, a training software company that helps customer service and sales teams do better work, to help train our employees internally and prepare them for success. In addition, we’re always on the lookout for other training and professional development opportunities available with our partners that could benefit our team. Because we know an engaged, empowered and educated workforce means better results—for everyone, especially our customers! Learn more about Custom Concrete’s mission and customer promise here or check out our current employment opportunities.